Imagine you are in a room. On one wall, there are windows to the outside and underneath them is a line of dirty white radiators. The floor is hard gray squares, and the ceiling is off-white rectangular panels. A few sand colored metal fans hang lazily from the ceiling. The walls are rough cinder blocks, painted half dark-tan and half off-white. You are in a stripped-down classroom in the Sharpless building. Blue and green have calming affects and reduce stress, as they are associated with the peacefulness of nature. Plants and other natural objects are also calming. Why is it that only a few classrooms are painted blue, if it has such positive effects? Not only are tan, beige and off-white simple and non-distracting colors; they are said to be calming and make people feel happy. Off-white has also been said to be the best color for learning because of these reasons. Most students, when asked what they thought of the colors of the classroom walls replied with “they should change it” (“they” who?) or a simple “What?” Although off-white and tan may not be the most interesting colors, do the color of the walls need to be changed? No, but no one can deny the pleasantness of a light blue room. 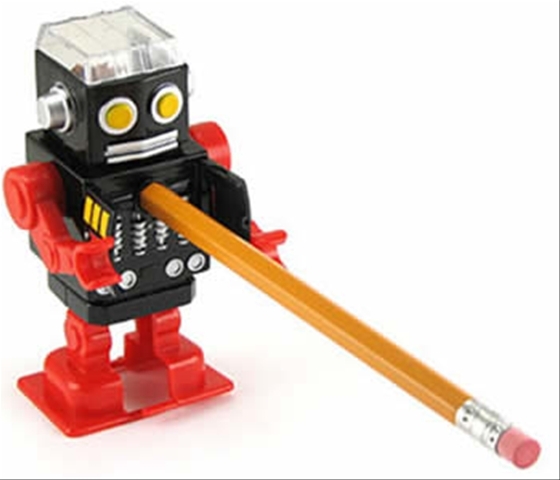 No one would care how well the pencil sharpeners worked if they looked like robots. Middle School. Schoolwork. Writing. Even in this day and age, with computers taking over our lives, writing by hand cannot be avoided, so a reliable, sharp pencil is important. Then why does it seem that in the Sharpless building pencil sharpeners are not? The pencil sharpeners in the Sharpless building are in many ways like the middle school students themselves. They can be classified into many different categories. There are loud ones that work, loud ones that don’t. Quiet ones that sit in the back of the class, but sharpen better than any others, and are, unfortunately, rare. The ones that look good but jam up and make strange noises if a pencil is put into them. The hand-crank ones that need help to get going, but make a nice, sharp point. Possibly most disappointing are the “industrial-strength” sharpeners that, for some reason, can’t last a year in a classroom. Some classrooms don’t even have pencil sharpeners, depriving students even of an ideal writing utensil. The loud pencil sharpeners. They interrupt classes, creating a few moments of rumbling sound when they are put to use. The teacher sometimes even has to give permission to use these, as they are so disruptive. They are also often the ones that chew up pencils and spit them out in smithereens. These provide a stark contrast from the best pencil sharpeners, the quiet ones that sharpen quickly, neatly and effectively. Unfortunately, one is about as likely to find one of these in the middle school as to find an elephant on the roof (which is impossible, because the average roof can hold 20 pounds per square foot, and an elephant weighs more than that, so it would fall and actually end up on the third floor, if not lower.) Luckily, a dull pencil can often last until there is a pause in the class where a noisy sharpener can be used. One might find it ironic that one of the best sharpeners in the middle school can be found in the computer room, where a pencil is rarely needed. This sharpener, like many of the best sharpeners, is not completely silent but instead sounds something like a far-off train. However, it makes up for that by quickly giving the pencil a sharp, smooth, even point. The art room’s pencil sharpener is the monster of sharpeners. It is big, loud, has a super-size shavings bin that is always full of colored flakes, and works amazingly well. The downside is that is there is only one sharpener and two art rooms. The sharpener is traded between the rooms every year. The room without the sharpener is left with small handheld sharpeners and the hand-crank sharpener on the wall. Both of these work well, but they require more time and (the horror!) effort. They are also prone to breaking the tips of the soft colored pencils. A few rooms in the Sharpless building do not have pencil sharpeners. This can lead to 45 minutes of messy writing with a dull pencil, borrowing a pencil or hand-sharpener from a classmate, or being excused to use the sharpener in another room. Maybe this is a subtle message that it is time to turn the page on schoolwork, from hand-writing to all typed. Sure seems like it. FOOD. For most dogs, this seems to be their one favorite thing. To get a dog to eat a piece of paper, try smothering it in peanut butter or cream cheese. Dogs love both of these. If you have a small dog, you might have to cut up the paper so they don’t just lick the peanut butter or cream cheese off, although this does kind of defeat the purpose of having the dog eat the homework, because you have just destroyed it yourself. Another solution is to use the homework sheet like wrapping paper and wrap up a tasty, strong-smelling piece of food in it. If you’ve ever given your dog a present, you probably know how this works. 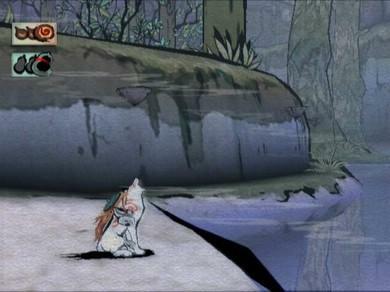 The dog tears through the paper to get to the food, and in the process, the paper is destroyed. In my opinion, (and my dog’s) this gets better results and is more fun than just putting peanut butter on your homework. 1. Do not do this too often, or your dog could get sick, and that would be hard to explain. 2. Do not bring the remnants of your homework to school to show your teacher, because that is weird and disgusting. A picture of it is okay, but no slobbery paper pieces. Although this does get rid of some homework assignments, most are also online these days, and it’s going to take more than a little peanut butter to get a dog to eat a computer. Note: Please do not actually try these techniques unless you have so much pointless seeming homework that you think you might go on a rant and run into the wall. When you tell a teacher your dog ate your homework, you know who will probably get in trouble? No, not your dog. 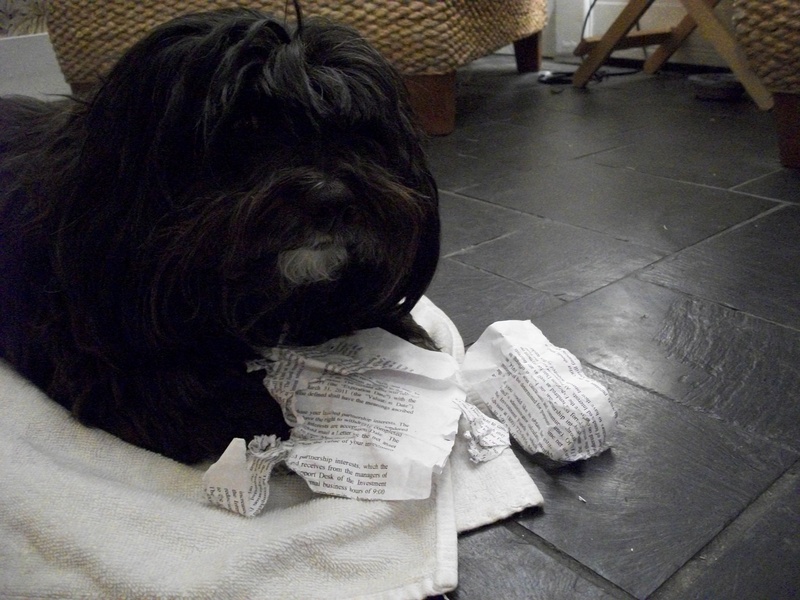 YOU, for letting your dog eat your homework and not doing anything about it, and I might get in trouble too, purely for writing this article. Also, even though an assignment may seem pointless, it is probably not. One of the Quaker testimonies that GFS follows is simplicity. Simplicity is the state of being simple, or uncomplicated. In the book Faith and Practice of GFS it says, “We are encouraged to balance our work and school lives with our family, community, and religious lives, not letting busy-ness overcome us.” So is our school actually simple? Is GFS encouraging the teachers and students to live simply? These days, what I consider a “simple” week is one where everything is normal. On a simple week I have the classes on the days my schedule says, and sports after that. Then I come home and do homework. On a day when I have a game for sports after school, another activity not school related, or even just an unusually large amount of homework, I feel overwhelmed. Usually, I feel overwhelmed about getting schoolwork done, because GFS is such an academically demanding school. Often times when I get home late and have homework to do, I don’t get time to do things with my family, or do anything else that I would like to do. In Faith and Practice of GFS the definition of simplicity is that “activities and possessions should not overwhelm us.” Another definition is that we shouldn’t let our academic and extracurricular activities interfere with the more important things in life, one of which is family. Look at November, for example. The first week we had no school on Friday, and Wednesday was a Friday schedule. The second week was a full week, but we had open-house day on Thursday. On top of that, Thursday was a Friday schedule. But Friday was also a Thursday schedule. (Note to whoever scheduled that week: It makes no sense and it seems that the only point was to confuse us more.) In the third week of November there was no middle-school on Friday for parent-teacher conferences, but the rest of the school didn’t have the day off. That makes it more complicated for parents, too. One parent reported that they “sometimes drive to GFS four or five times a day” because of their children’s schedules. One thing to consider, though, is that one reason the school schedules are so complicated and often overwhelming is that at GFS students have a lot of freedom to choose what they do and don’t want to participate in. Different activities require different amounts of time, which makes scheduling more complicated. A student or teacher’s life at GFS is often not very simple, but why is this? I think this is because GFS has a high academic standard that requires a large amount of homework. Also, because GFS offers so many extracurricular activities for students to participate in that require more time. Another reason could be that instead of having longer core classes to get more done, at GFS we get to participate in other activities, including art and music classes, gym class, Meeting for Worship (which, by the way, is meant to help simplify and un-clutter our lives), and project time activities. A simpler life sounds nice, but is it really what we want? What do we sacrifice for simplicity?